Why did Nawaz drop Mumbai bombshell? All is fair in love and war, goes the old adage. Pakistan’s disgraced and deposed Prime Minister Nawaz Sharif is well and truly on a warpath against his perceived enemies and even the most seasoned and jaded of Pakistani pundits feel squeamish to predict how far—and to what denouement—the man would be prepared to wage what’s to him is his crusade, but to his detractors is only personal vendetta. If there were any still game to wager on Nawaz’s agenda, all those bets came off quickly in the wake of what to many seemed like Nawaz deliberately exploding a bombshell in a newspaper interview. The Mumbai attack of November 2008 is a sore and sensitive point for Pakistanis from day one of the tragedy’s occurrence. It hurts national sensitivities in Pakistan because the perpetrators of the bloodshed were believed to be Pakistani non-state actors. In common parlance, those who committed the crime were terrorists. It’s a subject rarely discussed in Pakistan. It’s especially shunned from discourse at a public forum or platform. The well-informed Pakistani intelligentsia—some sections of it, especially those active in social media—have no moral hangover in conceding that non-state actors did wreak havoc on Mumbai, just as they have been responsible for wanton acts of terrorism within Pakistan itself. However, the laymen’s conventional wisdom, in reverence to the haloed ‘establishment’ has consistently been in denial and has no compunction in parroting it as far as any Pakistani responsibility or involvement in the grisly episode is concerned. It couldn’t, therefore, be other than shocking, to say the least, for the Pakistanis’ sensibilities to hear a former PM—and that too a leader who has held the title for an unprecedented three times—blaming his country and its establishment for exporting terrorists across the border and spilling the blood of more than 150 innocent Indians. 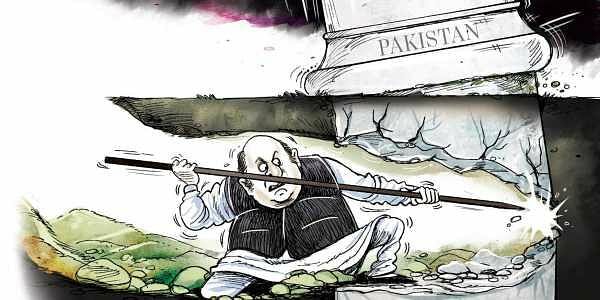 Why did Nawaz have to do what he did is the question that has been on Pakistani lips incessantly since he chose to hit his countrymen with that bolt from the blue. Macabre and weird are the adjectives profusely used by pundits and commentators who were caught ill-prepared, like the rest of Pakistan, for Nawaz’s salvo. But Nawaz seems to have meticulously choreographed the episode. His interview in Pakistan’s largest English newspaper, Dawn, hit the headlines on May 12. A day before that Nawaz sent a private plane to Karachi to ferry Cyril Almeida, Dawn’s ace columnist, to his sprawling estate outside Lahore. The journalist hadn’t asked Nawaz for an interview. It was Nawaz who roped him in. Interestingly, or intriguingly, Cyril didn’t ask any question about Mumbai. Nawaz himself brought up Mumbai into the conversation questioning why non-state actors were sent to India to wreak havoc. Cyril is the same journalist who was at the centre of a storm two years ago, when Nawaz was in the saddle. He was the one who blew the cover off cloistered proceedings of a top-secret meeting of the National Security Committee. Remarks were, on that occasion, attributed to Nawaz berating his own national security apparatus and advising housecleaning. Later, however, Nawaz was the one who decried as fabricated and concocted what had engulfed Pakistan’s media and political horizons as the ‘Dawn Leaks.’ Choosing a controversial journalist for a gratuitous interview and then bringing up an issue of extreme sensitivity, off his own bat, couldn’t be anything but a calculated and choreographed exercise to take the country by an unprecedented storm. From Nawaz’s own perspective there’s little confusion that he wants to take on his enemies in the establishment. He and his daughter, Maryam, have long been doing this at their public rallies. Nawaz may well have decided that he has nothing more to lose. He has been driven up the wall, and in a refrain used nauseatingly by the father-daughter duo, finds himself in a blind alley. Aggression, he may have inferred, is his defence of last resort. But timing in politics is as important as in cricket. A mistimed stroke can get a player clean bowled and an ill-timed utterance can land a political leader into tonnes of hot water. Nawaz, and much more than him, the party he still espouses to lead to victory at the forthcoming general elections, now face that dilemma. explain the plush and expensive properties in London and elsewhere. On top of it, an old case in the apex court of the 1990s has opened up again in which he was the prime beneficiary of money doled out to politicos like him who had, then, been arrayed against Benazir Bhutto. The same establishment which is now at the receiving end of his barbs patronised him to beat Benazir at the 1990 general elections. So, his own partisans are at a loss to decipher what ‘service’ he intends to do to his partymen at the upcoming elections by letting himself and them, by implication, exposed to the charge of being India-friendly. It can’t be anything but political hara-kiri for any politician or party to enter the electoral fray with that kind of stigma. Only Nawaz can answer why he felt impelled to show his detractors the red rag at this juncture. Whose side is he on? Former Pm Of Pakistan may have just one point agenda: to survive against all odds. Whether he succeeds or not not will not be known immediately as several court cases are pending against him.